The embryo, contained within the seed, is the next generation of plant. Thus successful seed germination is vital for a species to perpetuate itself. By definition, germination commences when the dry seed, shed from its parent plant, takes up water (imbibition), and is completed when the embryonic root visibly emerges through the outer structures of the seed (usually the seed or fruit coat). Thereafter, there is seedling establishment, utilizing reserves stored within the seed, followed by vegetative and reproductive growth of the plant, supported by photosynthesis. The seed is metabolically inactive (quiescent) in the mature, dry state and can withstand extremes of drought and cold. For example, dry seeds can be stored over liquid nitrogen at -150 degrees Celsius (-238 degrees Fahrenheit) for many years without harm. Upon hydration of a seed, metabolism commences as water enters its cells, using enzymes and structural components present when the seed was dry. Respiration to provide energy has been observed within minutes of water uptake. Mitochondria that were stored in the dry seed are involved, although initially they are somewhat inefficient because of damage sustained during drying and rehydration. During germination they are repaired and also new organelles are synthesized. Protein synthesis also commences rapidly in the imbibing seed. Early during germination, stored messenger ribonucleic acids (mRNAs) are used as templates for protein synthesis, but later in germination these are replaced with newly transcribed messages, some of which code for a different set of proteins. Although the pattern of seed protein synthesis changes during germination, no proteins have been identified as being essential for this event to be completed. Elongation of cells of the radicle (embryonic root) is responsible for its emergence from the seed. This is a turgor -driven process and is achieved through increased elasticity of the radicle cell walls, by a process which is not known. Cell division and deoxyribonucleic acid (DNA) replication occur after germination, as the radicle grows, and reserves of protein, carbohydrate, and oil, stored in the dry seed, are used to support seedling growth. A kidney bean sprouting into a seedling. The stages of germination and early growth. to years, a phenomenon called dry after-ripening. But many seeds remain dormant in a fully imbibed state; they are as metabolically active as nondormant seeds, but yet fail to complete germination. Dormancy of these seeds may be broken by one or more of the following: (1) light, sunlight being the most effective; (2) low temperatures (1 to 5 degrees Celsius [33.8 to 41 degrees Fahrenheit]) for several weeks; (3) day/night fluctuating temperatures of 1 to 10 degrees Celsius (41 to 50 degrees Fahrenheit); (4) chemicals, such as nitrate in the soil, or applied hormones (gibberellins) in the laboratory; and (5) fire. 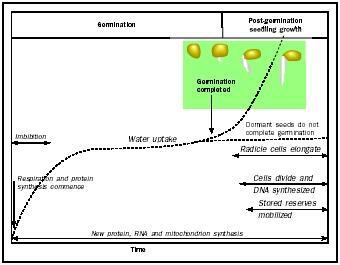 Dormancy mechanism operate to control the germination of seeds in their natural environment and to optimize the conditions under which the resultant seedling can become established. Dormant seeds that require light will not germinate unless they are close to the soil surface; hence germinated seeds will not expend their stored reserves before they can reach the surface and become photosynthetically independent seedlings. This is particularly important for small, wind-dispersed weed seeds. The light-perception mechanism in light-requiring seeds involves a receptor protein, phytochrome, which is activated by red wavelengths of light and inactivated by far-red (near-infrared). Far-red light from sunlight penetrates farther into soil than does red, but also light penetrating through a leaf canopy is richer in farred than red, since the latter is absorbed by photosynthetic pigments in the leaf. Hence, germination of light-sensitive seeds is advantageously inhibited under a leaf canopy and helps explain why germination and subsequent plant growth is so profuse in forest clearings. Seeds that need a period of low temperature cannot germinate immediately after dispersal in the summer or early autumn but will do so after being subjected to the cold of winter, conditions that may cause the parent plant to die, and thus remove competition for space in the spring. The requirement for alternating temperatures will prevent germination of seeds beneath dense vegetation because the latter dampens the day/night temperature fluctuations; these seeds will germinate only when there is little vegetation cover, again reducing competition with established plants. Seed dormancy is also important in relation to agricultural and horticultural crops. Its presence causes delayed and sporadic germination, which is undesirable. On the other hand, the absence of dormancy from cereals, for example, can result in germination of the seed on the ear, causing spoilage of the crop. Thus having mild dormancy to prevent this, which is lost during storage of the seed (dry after-ripening), is desirable. Bewley, J. Derek. "Seed Germination and Dormancy." Plant Cell 9 (1997): 1055–1066. ——, and Michael Black. Seeds: Physiology of Development and Germination, 2nd ed. New York: Plenum Press, 1994.